My next interview in the “Outlander- the fans who make it” series is with Cyn Luckey, a woman who this fandom is very lucky to have as our resident poet. I met Cyn on Social Media through her poems, and hope to meet her in person soon. ● Please tell us about yourself? My name is Cyn Luckey and I live in Woodstock IL.. I am 67 years old, have two beautiful daughters, who are both married, and six incredible grandchildren. 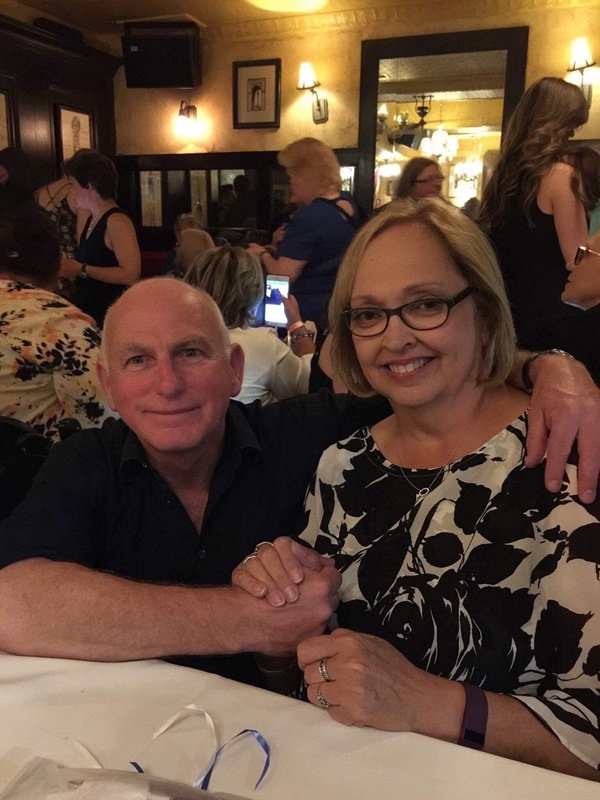 I have been married to the same sweet and lovely man for 45 years. It has truly been a wonderful life. Although I consider myself an emotional person, I’ve had very analytical jobs throughout the years (banking, proof reading copy for a newspaper), It may have inadvertently contributed to my continuous and absolute need to write. My hobbies are reading everything I can get my hands on, listening to music and writing poetry. ● Have you been a poet all your life, or is this something recent, and can you tell us a little bit about that? I started writing poetry in grade school. 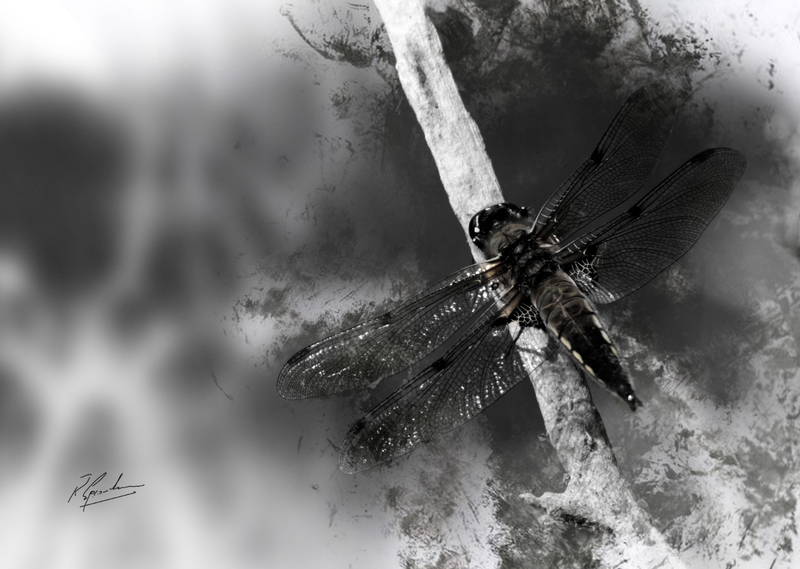 I loved putting lines of images together, and I would spend hours agonizing over the perfect word. 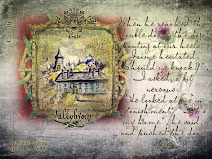 I realized even then words had incredible power - to hurt, to hinder, to help, to heal. I also realized I had a responsibility to use the right ones. I wrote in earnest for many years, poetry mostly, and lyrics for songs I composed. I moved to Colorado and tried my hand at folk singing. Music took over my life for a while, but it was still a matter of finding the right words and connecting with an audience. I love the Outlander interaction on social media. 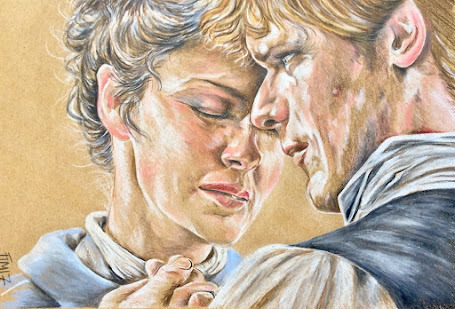 I marvel at the talent of Outlander fans - their art, their edits, their dedication - it’s such an incredible delight. I try not to stay on social media for too long every day, but it can be addictive, no question. 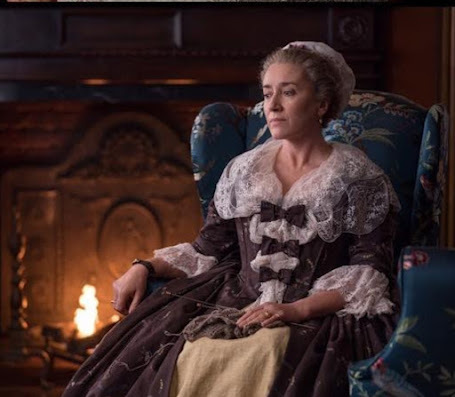 Outlander is, to me, an epic poem, full of love and hate and revenge and forgiveness, not unlike the tales of Homer, the heroic saga of Beowulf, or the lessons of Metamorphosis. 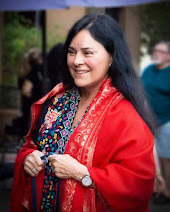 Diana Gabaldon has given us a unique and beautiful story. We relate to the very human traits of these wonderful characters and, in turn, begin to understand ourselves. It is a riveting, rollicking adventure and we are along for the ride, laughing and loving and suffering and dying right along with them. Diana employs words as an artist, painting a time and a place and a feeling that sweeps us away and allows us to experience another life, another lifetime. This is prose with words perfectly in place - to give us pause, make us reflect, move us to tears. This is poetry to me. The show is astonishingly beautiful in every respect, from the perfectly detailed sets and magnificent costumes to the heartbreakingly moving acting. It is not simply an incredible production, it is groundbreaking television, and I have loved it from the very beginning. I look at it like a translation of the original language into another dialect, just as delightful, as tragic and as emotional, but with an accent that may often slightly change the interpretation of a scene. 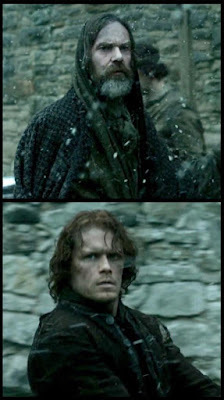 For instance, I loved that our dear Murtagh survived. In our heart of hearts, we were not ready to say goodbye to him. I will always believe that Ronald D. Moore and the producers did this, in part, for us, the fans. 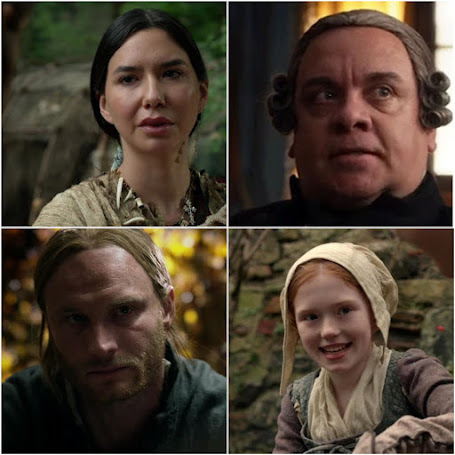 That is how much respect and love for this story is evident on both sides of the Outlander coin. I would like to add how much I believe music plays a part in Outlander. Though it might only ‘seem' to fade into the background, music sets a tone that voices cannot, and can do it in the blink of an eye. Bear McCreary has gifted us with an amazing sense of place, of time, of history. When I am writing, I listen to all kinds of music, from soundtracks to classical to gospel to hip hop, and back again. Years later, I can often tell what type of music I was listening to by the tenor of my words. Music is a big part of my life, so naturally it is a big part of my poetry too. The “character” of Jamie & Claire is my favorite. It’s really not cheating - picking two - for one cannot exist without the other... so I love them both. Even when attempting to go on alone, they never forget where they really belong. 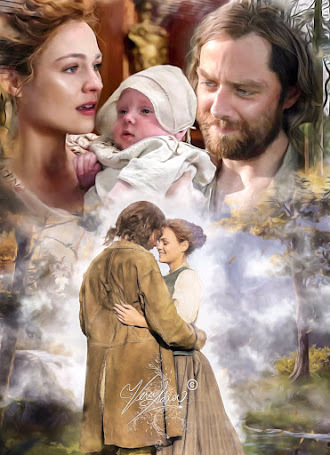 This is the beauty, the tragedy and the truth of Outlander: when we finally find our home, it is forever, and no matter where we go, we are compelled to return to where our life truly began. ● How has Outlander affected your life and/or lifestyle? Is this the first fandom you are a member of? What made you decide to join this fandom, rather than any other one? Because of Outlander, I have met so many completely and utterly amazing, wonderful people. 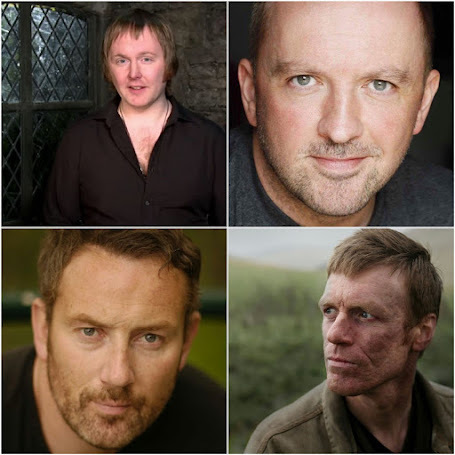 They are all compassionate, generous, eloquent and funny - qualities so prevalent in the characters of Outlander. I believe that is why this fandom has thrived for so long - it is a meeting of similar minds and hearts - loving, caring and kind, every single one. 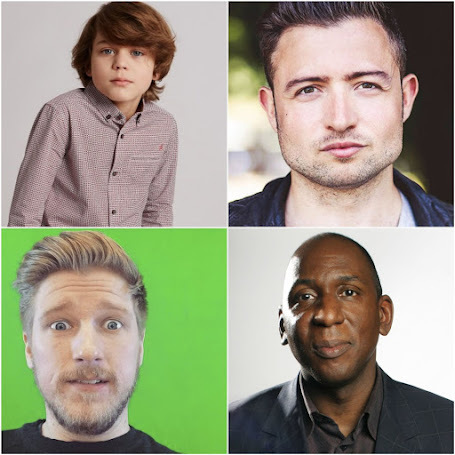 ● Have you met any of the actors? 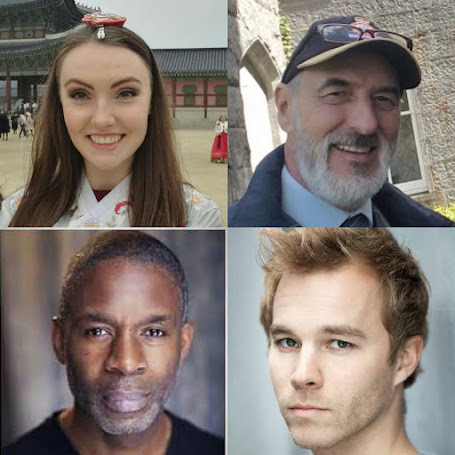 If so, which actor did you enjoy meeting the most? If not, which one are you looking forward to meet the most? I have recently met Gary Lewis, Graham McTavish, Steven Cree, John Bell, Lauren Lyle, Cesar Domboy, Grant O’Rourke and Ed Speleers at Sasnak City Con in Kansas City, MO. They were all such a delight - funny, sweet and incredibly generous. 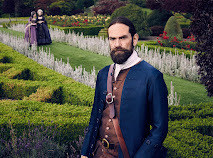 Though I think all the actors are absolutely wonderful, I hope to meet Duncan Lacroix one day just to tell him how much I loved his heartfelt performance; how well he tread the line between sour and sweet, gruff and tender, the killer and the kindhearted. 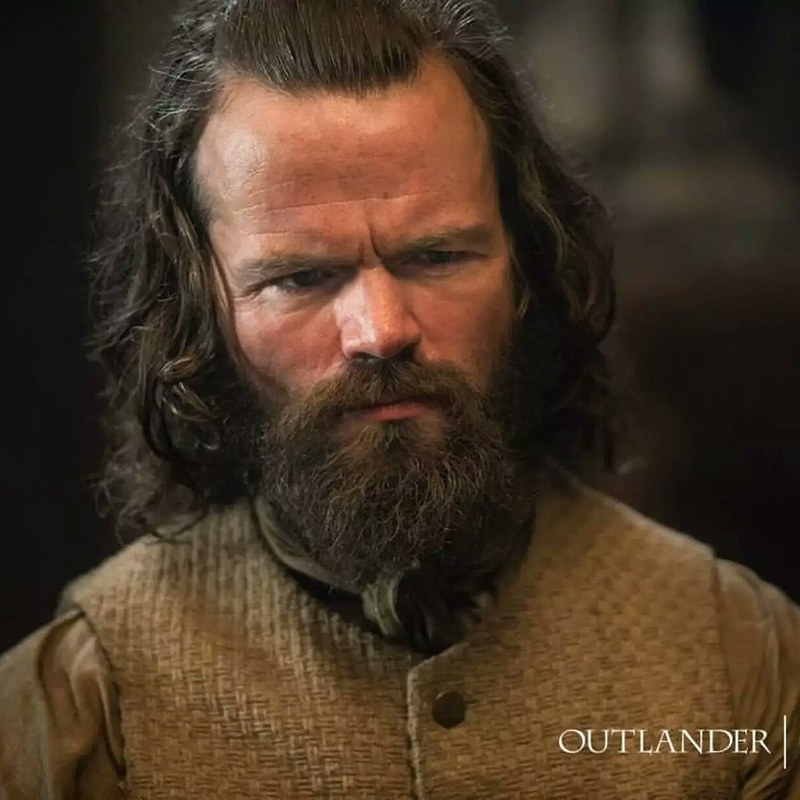 As Murtagh, he grounded Jamie, guarded his right, and gave him the guidance and the grit to survive. He was a treasure. I’ve missed him. 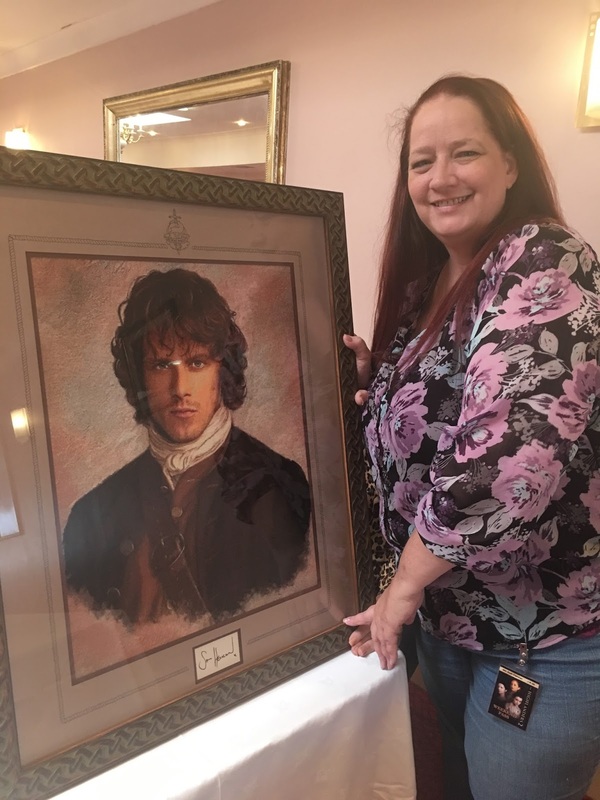 My next interview in the “Outlander – the fans who make it” series is with Beth Elahmar, who makes incredible cross-stitch portraits of the Outlander actors and raffles them for charity. I first met Beth on Twitter, and then had the opportunity to meet her in person last year at the Highlanders Con in Blackpool and to admire her amazing work. The quality is so fine that, even when you are standing in front of it, it looks painted, rather than stitched. I was in awe of the fineness of the work and later, of her story. I have only just learned that Beth is hard of hearing, as I never noticed it when we were chatting. It was a true pleasure to meet such a kind and warm-hearted person. ● Please tell us about yourself. My name is Beth Elahmar - pronounced E - lahk – mar. A lot of people want to pronounce it El - ah - mar, but no. It's got an "h" that sounds like a "k"- I live in Tucson, Arizona and I'm 51 years old. 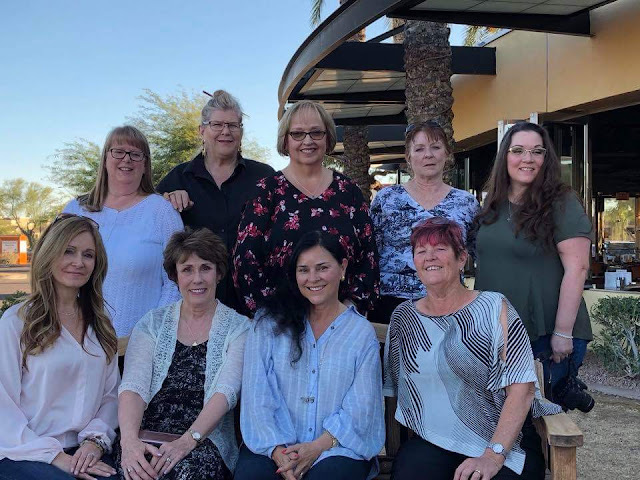 For the past 15 years, I've worked for a bankruptcy and collections law office as a project manager, in the accounting department. . I have 3 cats. I’m hard of hearing and depend a lot on lip-reading. Working for a bankruptcy law firm can be a bit disheartening at times, because you are seeing debtors that have reached rock bottom. They've lost everything and have had no choice but to declare that they are bankrupt, and we're tasked with asking them for the money to pay their debts. One case has always stayed with me and has reinforced my determination to always be kind, to always lend a helping hand to those who have fallen on hard times. There were parents that had lost their daughter, due to malpractice of the hospital she had been in. Not only did they suffer the crushing and devastating loss of a child, they lost their savings, they lost the money they'd won through a malpractice lawsuit and they were forced to sell the plots on either side of their daughter's grave, because the courts deemed them unnecessary and wanted the money to pay their debts. It was heartbreaking, and I’ve never forgotten it. Since I work in the accounting office and not in the collections department, I’m blessed that I don't have to speak to the debtors on the phone, rather I read their court documents. It takes a certain personality to be a collector and I simply wouldn't be able to do it. I have too soft a heart to ask someone with nothing for more. My hobby is cross-stitching, though I'm hesitant to call it a hobby. It's more of a lifesaver for me, as I suffer from anxiety & depression, and my stitching is my therapy. I don’t have any other hobbies, as cross-stitching is my main focus. When you create portraits such as mine, it forces you to concentrate and not think of anything other than making the item come to life, so to speak. It shuts out the noise of the world around you and you’re caught up in the creation of the portrait. I've always thought cross-stitching was like painting by numbers, only with a needle and thread, versus a brush & paint. I've been told many times that my type of cross-stitching isn't like the stitching of our grandmothers. I like to think it could be compared to writing a book, I suppose. You start with an idea, a plot so to speak, then the colors end up being your words. You spend so many hours, weeks and months creating it, that you literally become part of it. A myriad of emotions are stitched into it, so that, when it’s finally finished, you've created a story. It has a hero or heroine (the individual in the portrait) and many antagonists (the stitches you inevitably did wrong and have to rip out). You literally have blood, sweat & tears in it (needles are sharp little buggers and when you've spent months on a portrait only to realize you've stitched it with the fabric going the wrong way, trust me, the tears flow and the sweating starts, because you scramble to find an easy fix to it, without scrapping the whole project and starting over. The Laird is a perfect example of that complete screw up). You look at the final piece and remember where you were, what was happening while you were creating it and then you're already thinking of the next one. The next story. ● What made you start the Cross-stitch project and can you tell us a little bit about that? 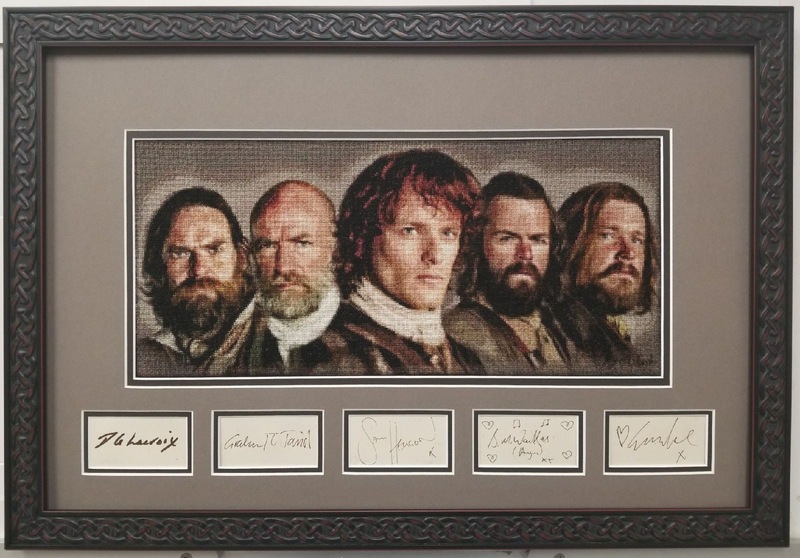 Have you also done cross-stitch projects for other shows or only for Outlander? I have been cross-stitching for 19 years. I'm self-taught. I started cross-stitching as a way to convey my sympathies for a co-worker, who had lost his son in a tragic accident. I sent his photo away to have a pattern made and, after completing the portrait, my father was convinced I could design my own patterns, so he bought me the software I needed to create and stitch my own patterns. I have done cross-stitching for a few other shows, such as ‘The Vampire Diaries’, ‘The Originals’, ‘True Blood’ and ‘Scandal’, but it wasn't until I started stitching Outlander, that my charity work took off. 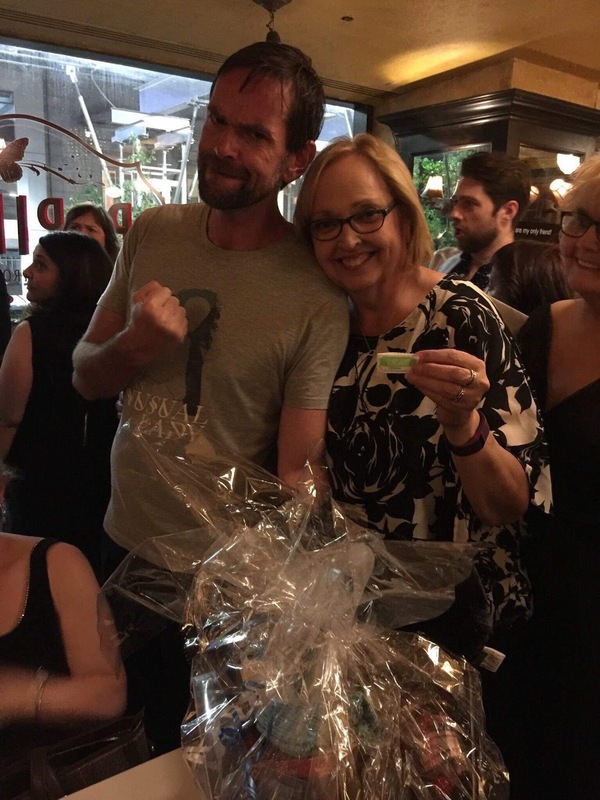 There wasn’t a lot of interest in helping promote the raffles I had for Ian Somerhalder & ‘The Originals’, so they barely raised $1200 each. I was so disheartened and discouraged, that I swore I'd never put my work out there to be treated like that again. 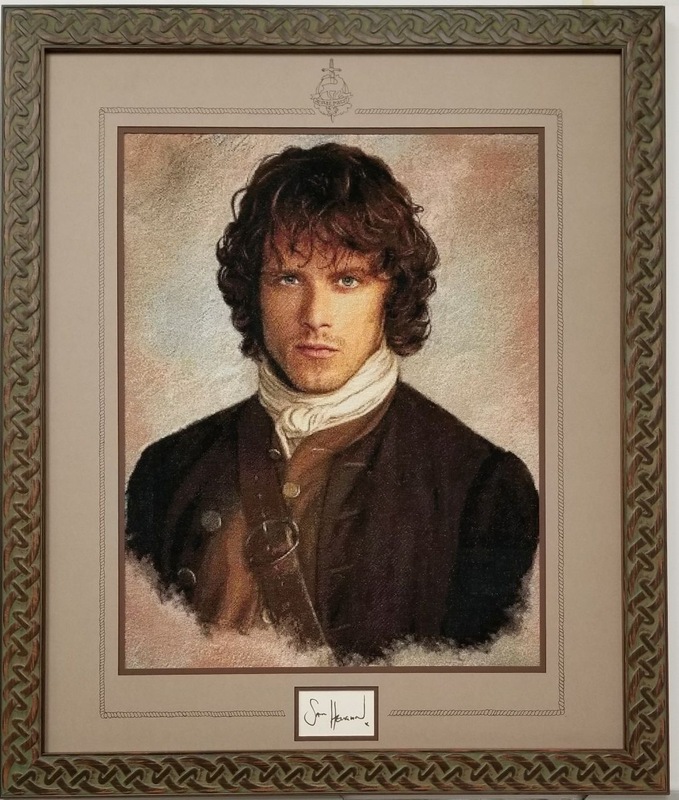 But, when I started The Laird, it got the attention of The Southern Sassenachs, who asked me if I'd be interested in raffling The Laird. They listened to my concerns and recommendations, regarding what I wanted to achieve with my work, and promised to give it the respect it deserved. They posted it on Twitter, and in many fan groups on Facebook, and from there it just took off. One friend brought it to the attention of Sam, and he wrote me a note expressing a desire to see the finished product, and provided me with his autograph to be included in the portrait. After that, a lot of fans from the show saw it and, the next thing we know, the raffle had raised over $10,000 for Caitriona's & Sam's respective charities, World Child Cancer & Bloodwise. Upon meeting Sam & Caitriona in San Diego, I offered to do more portraits for their charities. 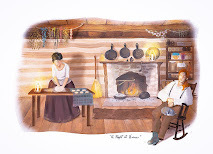 They were thrilled to hear that, and chose the next portraits to be completed. 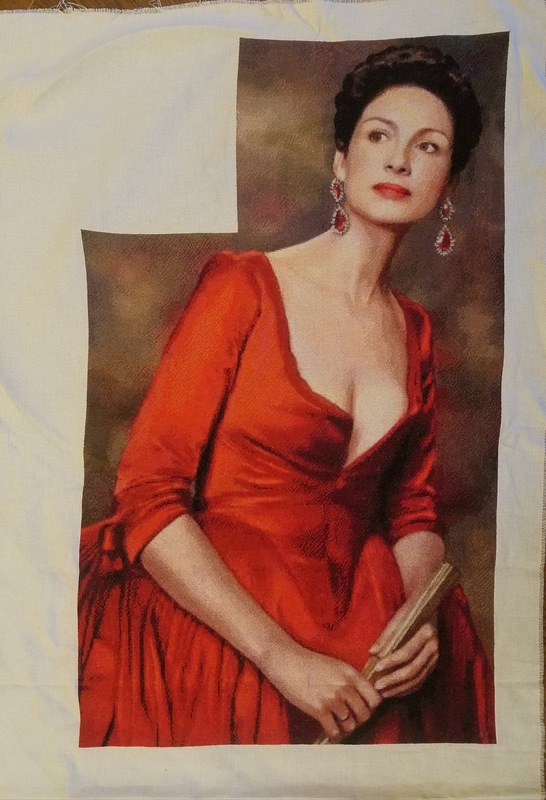 When I was in NYC, I showed Sam a picture of The Laird’s Lady that I was tinkering with at the time, and he requested that I finish that one before completing the two he and Caitriona had chosen. 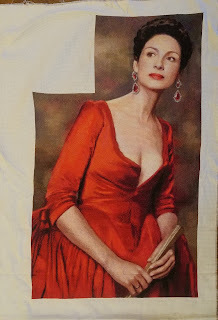 The Laird's Lady has been nearly completed and will be raffled by The Southern Sassenachs at the end of July. ● How much time do you spend every day on your cross-stitch project? I work full time. So, when I'm not working, I’m stitching. For example, when I get off work at 3, I'll come home and I'm stitching by 4pm and will keep at it until about 10 or 11 at night. Then, on the weekends, I'm up at 5am and I'll stitch all day until about 10 or 11 as well. It's normal for me to spend about 30-40 hours a week stitching. Sometimes more, time permitting. ● What do you like most about the Outlander books and show? How much time do you spend on Outlander? 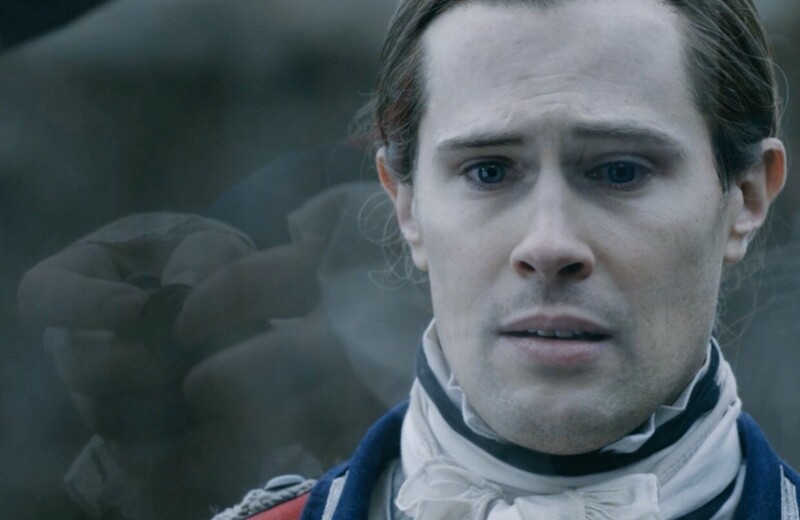 I’m one of those fans that hasn't read the Outlander books yet, though I finally took the plunge and read the Lord John Grey series. 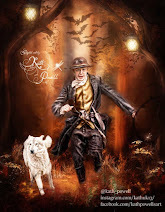 I was brought into the Outlander world by my good friend Pilar and another friend Karen R. Frantz, the artist. I fell in love with Karen's work first and she insisted I watch the show. Pilar seconded that motion and, before I knew it, I was binge-watching the first season until 2am, because I couldn't turn the bloody thing off. I was captivated. I started researching every image I could find and decided to make a portrait of Jamie as The Laird. I'm fiercely loyal, like Murtagh, so I relate to him the most. I love how he is always solid, yet you know there is a story that lurks behind his eyes. He keeps everything close to his chest, except when he's with Jamie. He's someone you always want in your corner. 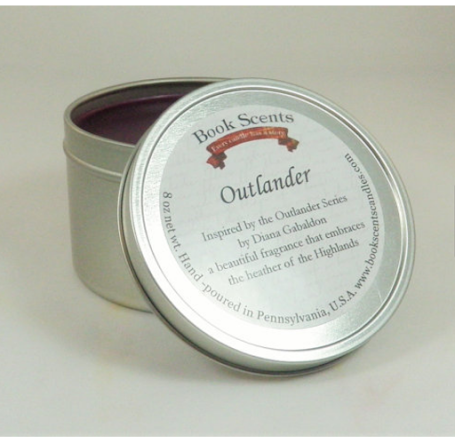 Outlander is the focus of my creations right now. I have several projects in the works including a personal portrait for a former cast member that'll I'll be working on when I'm finished with The Laird's Lady. If all goes according to plan, I'll be delivering it to him personally when I travel to Scotland this summer. Outlander has played a huge part in getting me to finally travel abroad. I knew that, if I wanted the cast to see my work, I was going to have to go to them. At the time, the conventions were all in Europe. So, I got my passport for the first time when I turned 50 years old and booked my first flight. I want to experience every aspect of it, not only from the filming locations aspect, but also from the actual historical parts that Diana has woven into her beautiful story. I’m planning to stand on Culloden battlefield on my birthday in July. I want to feel it. Diana has stated in the past that there’s something about the area that you can’t help but feel. The spirits are there. I want to experience it whole heartedly. It has also allowed me to raise funds for a very dear cause that is close to my heart. I lost my brother to suicide 34 years ago. In October 2016, I started a portrait of The Highlanders to help me through my grief of losing my father and decided, when it was done, that I wanted to raise money for people with mental issues, specifically the ones that suffer from depression like I do and like my brother did. I talked it over with Sam at the San Diego Comic Con and told him I wanted to use it for that reason. He was very supportive, as were the rest of the actors in the portrait. As of today, it has raised over $13,000 for Bring Change 2 Mind, a charity started by the actress Glenn Close to bring awareness to mental health issues and encourage people to talk about it and help prevent suicide. ● Is this the first fandom you are a member of? What made you decide to join this fandom, rather than any other one? What do you like and dislike about being part of a fandom? I was part of The Vampire Diaries & The Originals fandom for a few years. I think that, the difference between Outlander and the rest of the fandoms I've been part of, is the age group. 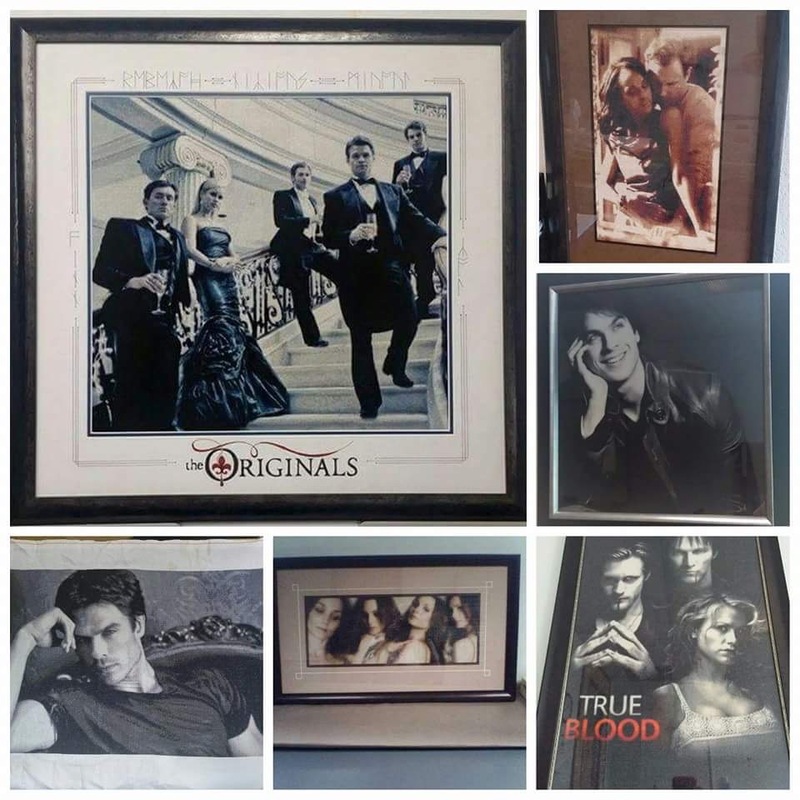 TVD & TO are mostly geared towards teenagers and young adults. They don't really see the actors as actors, but rather as the character they portray, which I've always felt was a disservice. Outlander fans don't do that. 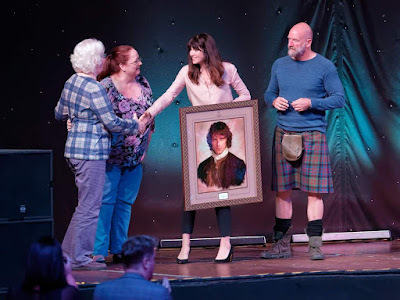 I've been to several Outlander gatherings and have noticed the behavior of those attending. They see the entire cast as human beings, who happen to have a really cool job. That's not to say that there aren't a few that cross the line. One of the things I dislike, is when they attack the cast & crew, simply because a scene didn't get filmed exactly the way the author wrote it. There's nothing wrong with being disappointed or passionate about a particular scene and how you think it should be filmed, but when you start demanding a pound of flesh with your complaints, that is crossing the line. It’s very easy to sit behind a screen and be an armchair director, producer, writer, but it's not an easy job to actually perform the work. I wish those that do this would take a breather, before launching an attack that involves name-calling and just plain nastiness. There's no need for it. I fear it will cause the cast and crew to pull back from social media platforms. We're considerably lucky, in this day and age. I remember having to send a letter to a fan club, just to get an autographed photo. They didn't have conventions and gatherings earlier, where you could actually get a hug from your favorite celebrity. 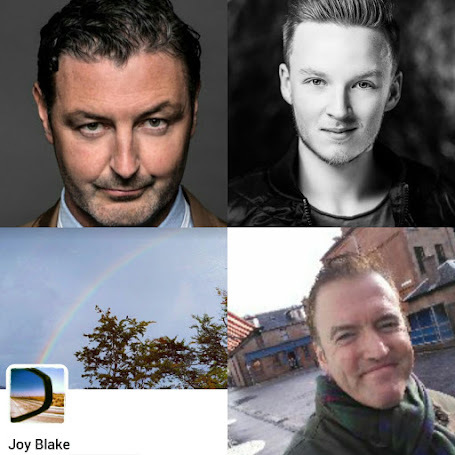 The thing that I like best about the Outlander fandom, is that there is a sense of camaraderie. A feeling of kinship. I've said that the Outlander fandom is filled with some of the most generous, kind and amazing people I've ever met. I've met a few people that I now consider very close friends, and a couple I'd consider family. There is fierce loyalty towards protecting the integrity of not only the story Diana has created, but also the performances and privacy of the cast members and crew. I love that. My next interview in the Outlander – the fans who make it” series is with Ruth Ann Carr, one of the founders of Clan Heughan, a group with tens of thousands of followers on Twitter and Facebook. I’ve had the pleasure of meeting Ruth Ann twice, once at Jibland in Rome and a second time in Scotland for the Highlander Fling, both in 2017. I have experienced her as being an intelligent, sweet, kind and interesting person, so it was important for me that she be involved in this project. Hello, my name is Ruth Ann Carr. I am 66 years old and live in Norman, Oklahoma. I was fortunate to marry an amazing man, Tony, who supported all my dreams and was comfortable in his own skin. We have three terrific children together, two girls and a boy. I’m a grandmother, and of course my grandchildren are simply the best. 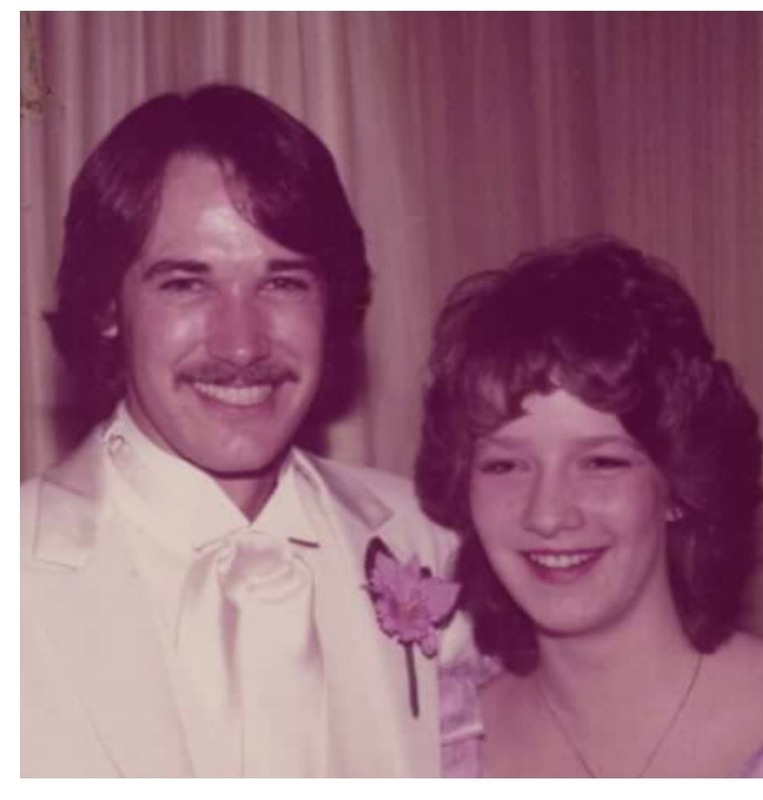 Tony was diagnosed with esophageal cancer in 2008. He died in February 2009 after fighting a courageous battle. Then, our first grandchild was diagnosed with leukemia in September of 2009 when he was two and a half. During this time, I was Superintendent of a large, highly diverse, high poverty school district. It was a very taxing job and a very difficult time in my life. 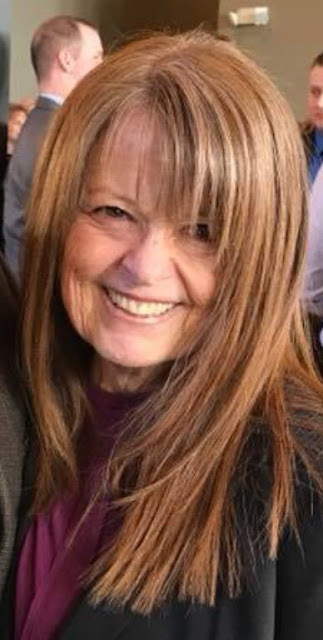 As a result of all the stress, and my desire to help my daughter as much as possible with the care of my grandson, I retired in July 2011. But something amazing came out of those dark days. My grandson is a leukemia survivor and celebrated his eleventh birthday this week. Professionally, I am a retired educator. I’ve taught at all levels from elementary through undergraduate and graduate school. I was an elementary principal, a junior high/high school principal, a Dir. of Personnel, Asst. Superintendent and Superintendent of Schools. While working, I also attended graduate school obtaining a M.Ed. and a Ph.D. in Curriculum, Instruction and Administration. I could not have completed my degrees without the support and encouragement of my husband and children. Although I am retired, I continue to conduct training for principals and superintendents in our state. It’s a great part time job, and I feel like I am giving something back. I love to read, attend sporting events, and watch movies and quality TV. I’ve always loved many types of genres in both my reading and viewing habits. My husband and I used to read many of the same books, but he drew the line at my romance novels. I also love to travel. I’m very interested in history, architecture, and learning about other cultures. Beautiful vistas refresh my soul and spirit, and I love being in the mountains. ● What made you start the Clan Heughan site and can you tell us a little bit about that? 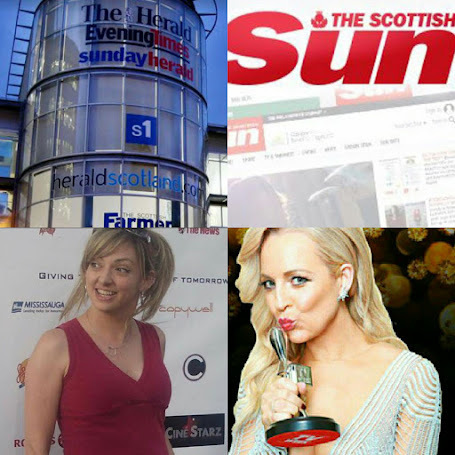 Four women who had never been fan girls in our lives decided to start Clan Heughan. We wanted to put our own spin on a fan group. 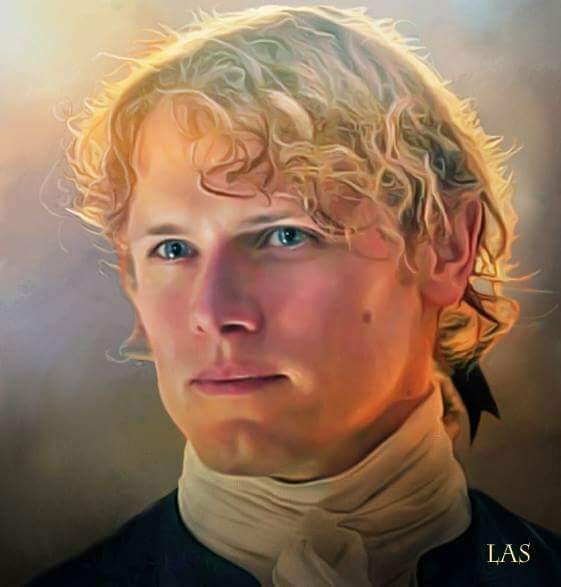 Lori Kuhns, Jamie Lynn Hunkins, Vickie Darago and I talked and dreamed about what we wanted Clan Heughan to be for several months, and then opened the group on January 1, 2016. We never anticipated that Clan Heughan would grow as it has. We are nearing 17,000 members that live in 99 different countries. We have some truly wonderful fans in our group. 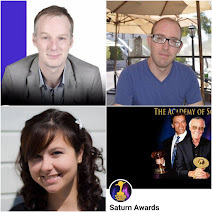 They are generous, respect Sam, and vote like maniacs in contests. 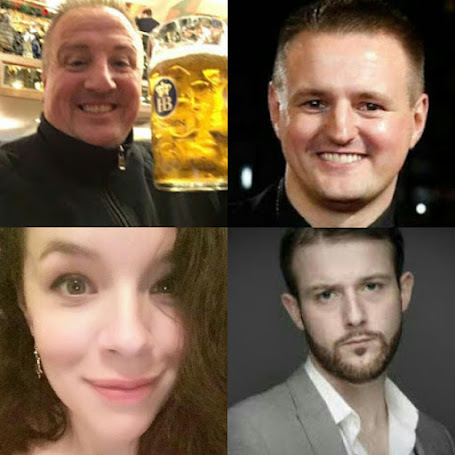 The four of us wanted fund raising for Sam’s charities to be a central part of Clan Heughan. We all had family and friends who had battled cancer, so it was very personal for us. We started raising funds for Bloodwise during our first month as a group. We also wanted to support My Peak Challenge and encourage our members to participate in MPC. Many, many of our members are also members of MPC. Secondly, we wanted to show our support by voting in contests and polls. 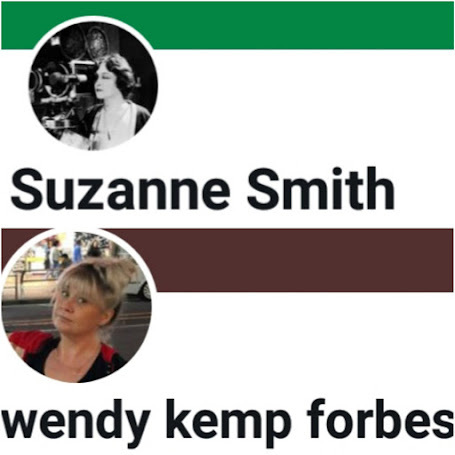 We firmly believe that voting and participating in Twitter events are important avenues for increasing the profile of Outlander in the media and getting more viewers. We are like most other fans and want to see all of Diana’s books brought to TV and we want to do whatever we can to help make that happen. 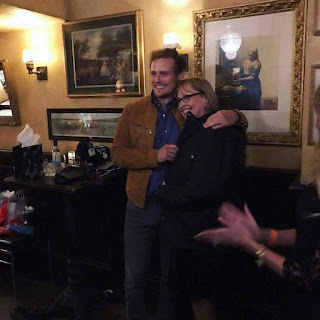 We also wanted to assist and support Diana, Outlander and Sam’s costars. There is perhaps a misconception that we only support Sam. 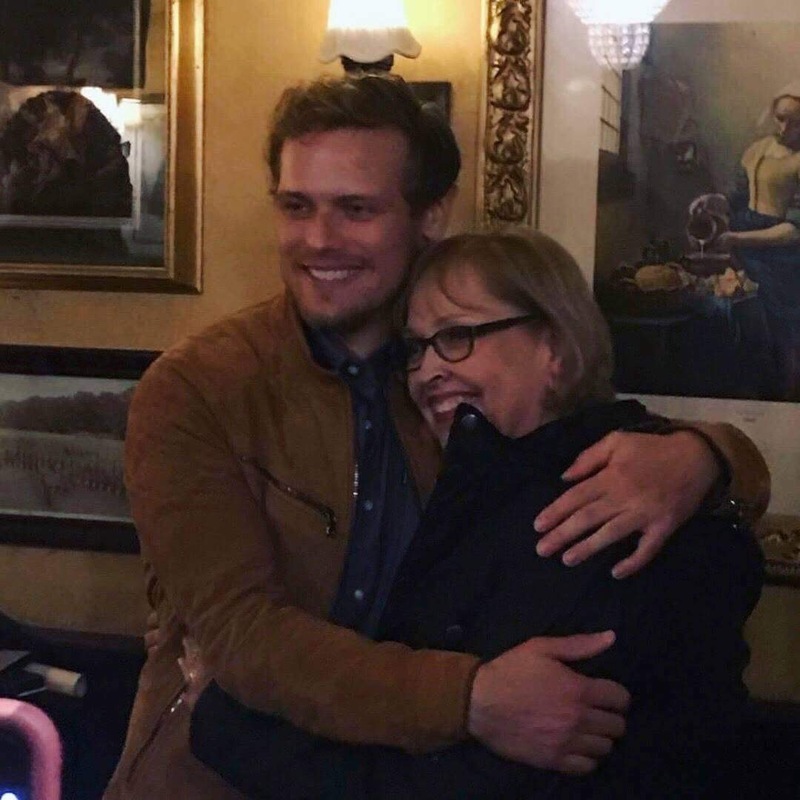 Sam is our focus and always will be, however, we support Diana, Outlander, and the other actors. We love Outlander and want it to flourish. One of our rewarding projects was to design a Clan Heughan pendant and kilt pin. We worked with Gordon Young of Hamilton and Young Jewelers. We are very proud of the way it turned out. Gordon was so kind to work with us, and his input was invaluable. Our group motto, Semper Te Experire reflects and honors the way Sam lives his life. It means “always challenge yourself.” The motto is incorporated on the pendant. 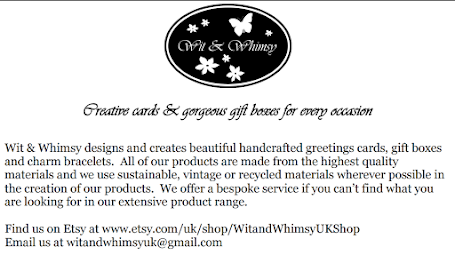 We also marketed and managed the orders and payment, and shipped the first two sets of orders ourselves, worldwide. It was both exciting and surreal to sit at my kitchen table and prepare a box to go to India. Our members can now order directly from Hamilton and Young. 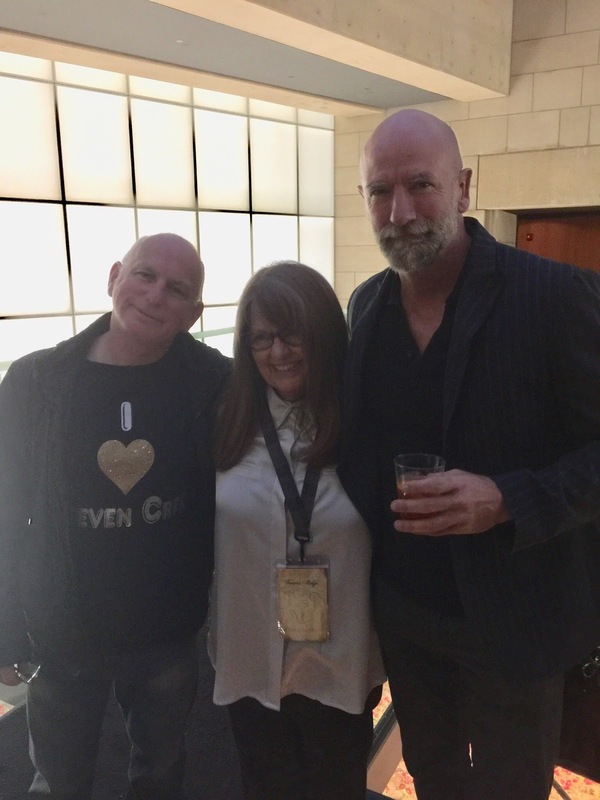 It has been so much fun to meet our members at Outlander and MPC events all over the world, and to see that they are wearing the pendant. ● What motivates you to organize collections of tens of thousands of dollars for Sam’s charities annually? It really is a matter of having experienced the pain and trauma of having loved ones fight cancer. It’s a very personal motivation for each of our admins and for many of our members. We truly hope to see a cure for blood cancers soon. We really appreciate Sam for actively supporting Bloodwise and sponsoring research studies into potential treatments for adults and children. One of the things I learned during my grandson’s treatment, was that research results have truly gone global. Thanks to technology, his doctors, were in touch with researchers and knew of cutting edge treatments from all over the world. No matter where the research is conducted, it has the potential to be shared with doctors and hospitals all over the world. We think that is important since our members are from so many different countries. We are particularly glad that Sam chose to add Marie Curie to his list of charities this year for My Peak Challenge. Again, on a personal level, we have experienced firsthand the support and importance of hospice programs. Many of our members have had similar experiences. We are currently in a fundraising campaign for Marie Curie. The response of our members has been amazing so far. We also have a special connection with Youth Theatre Arts Scotland. We believe Sam is an amazing actor, and we know that he feels a special kinship with YTAS. Our first funding campaign for YTAS came about as a suggestion from one of our members. It has been great to see how dedicated our members are to our fund raising efforts. 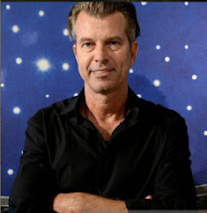 We have a great relationship with Kenny Mcglashan, the Chief Executive Officer of YTAS. We have regular communication with Kenny and his staff about our fund raising. We generally try to support a specific project that they are working on. 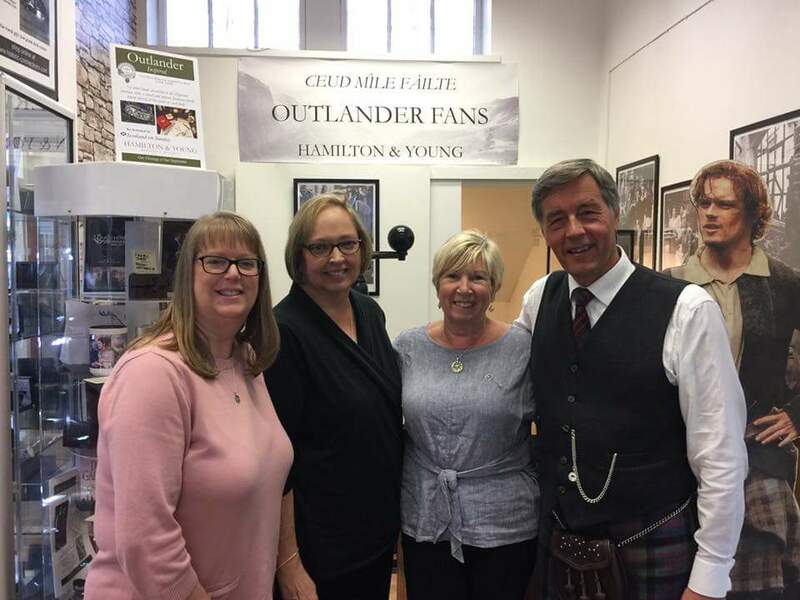 Three of our admins have visited with Kenny in Edinburgh. He took us on a tour of the theatre where Sam acted as a teenager. We have been able to share information about YTAS projects in our group. Those connections help make our fundraising for YTAS more personal for our members. We are also supporting Sam’s current fund raising campaign for Cahonas Scotland and his two marathons in two months. I probably spend way too much time on Outlander every day. I find myself fitting the rest of my life around Clan Heughan and Outlander. It’s like having a full time job except there are no weekends off. When we are voting in contests, we spend even more time. But I enjoy every minute of it. Well, almost every minute. I love so many things about the books and the show. I have always been fascinated by an author’s use of language. Diana’s writing probably contains the most enjoyable yet complex use of language that I have read. Diana creates amazing characters who represent such a depth and breadth of human behavior and emotion that it is impossible to be bored with them. 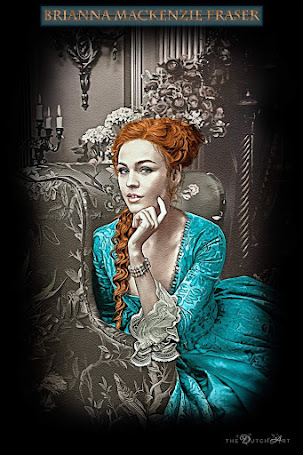 Diana’s books have so much packed into them that I have read them several times, and each time I get more out of them. But what I like most is the story. The story of two people who brave whatever life throws at them because of their love and devotion to each other. It is the story of a marriage in all its perfection and flaws. It is the ultimate love story, and it is about a couple, not an individual. As for the TV series, it is first and foremost a visual and auditory feast that just envelops the viewer with beauty even in its darkest moments. It brings my favorite books to life. The music, costumes, sets and cinematography are all wonderful. But the best thing about the show is the actors. There has not been a miss in casting, and the entire cast does a superb job. 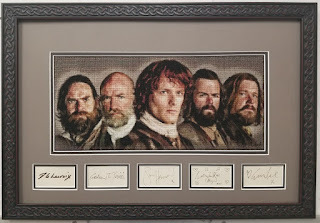 ● Which character in Outlander is your favorite? 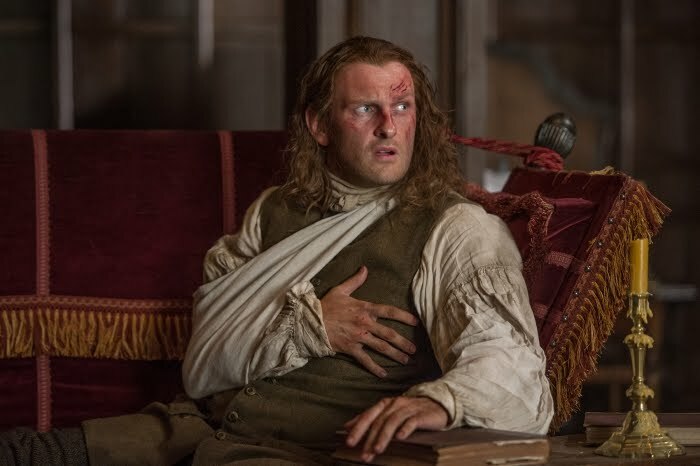 My favorite character is Jamie, and I think Sam was born to play the role. Jamie reminds me so much of my late husband. They share so many of the same character traits. I love Jamie because he never shirks what he sees as his responsibilities, and there are many. He loves Claire, his children and his extended family with a sacrificial love. That type of love is very special. 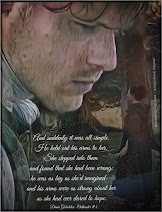 Although Jamie is my favorite, it is really not possible to think of Jamie without thinking of Claire as well. It is their marriage, their bond and their interactions which are the heart of the books. Outlander has had an amazing, positive impact on my life. 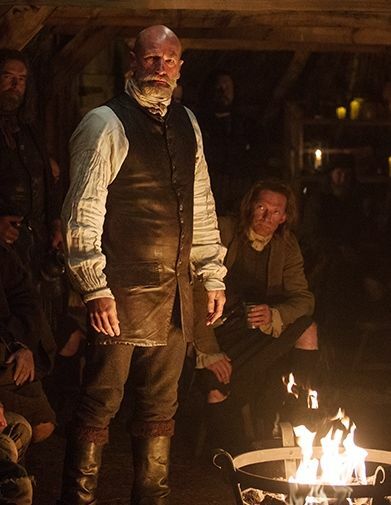 I came to the Outlander party late, because I did not discover it until 2014. Fortunately, Outlander came to my attention when I most needed something joyful in my life. I was still grieving for my husband and had lost interest in almost everything. However, Outlander was like a magic elixir. In reading and watching Jamie and Claire’s love story unfold, I was able to reclaim the joy in the 38 years of marriage I had shared with my husband, rather than focusing on the sorrow of his death. I have been fortunate to be able to thank Diana for the gift of her books in helping me through my grief. Because of Outlander, I’ve met some truly amazing women and men. They are friends for life. This love that we share for Outlander brought us together, but it also enriches our lives separately and together in so many ways. For instance, our admins and some fans that we know met in Scottsdale, Arizona last November. Two ladies traveled from Australia, others from Canada, Michigan, California, Virginia and Oklahoma. We had the pleasure of taking Diana to lunch and visiting with her for about two and a half hours. We also watched episode 311, Uncharted, together and visited the Poisoned Pen. But mostly we hung out and laughed. It was so wonderful to finally see each other in person after just interacting on Facebook. 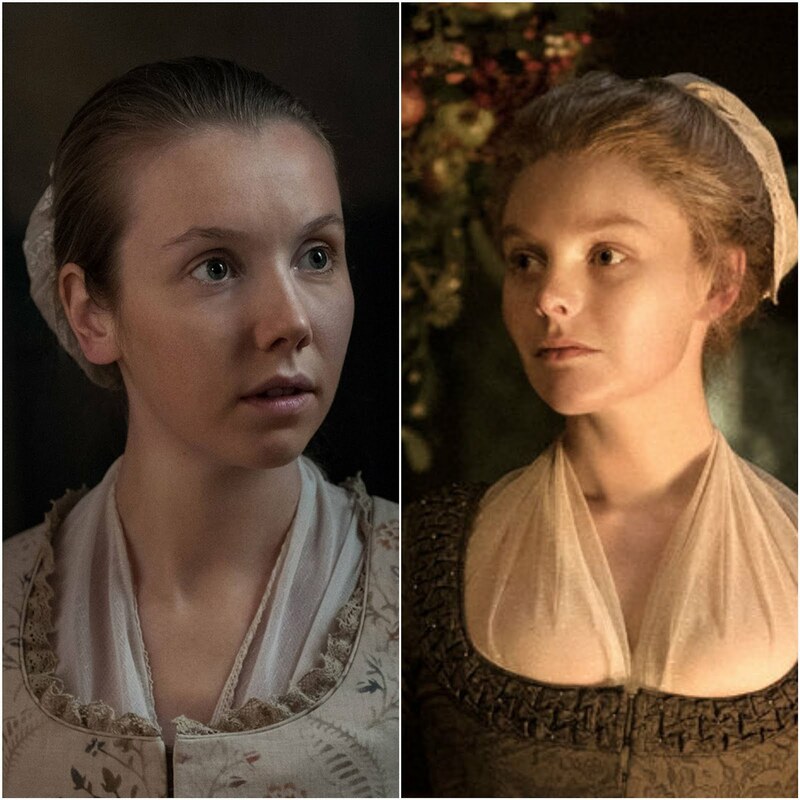 I would not know these wonderful ladies without Outlander. 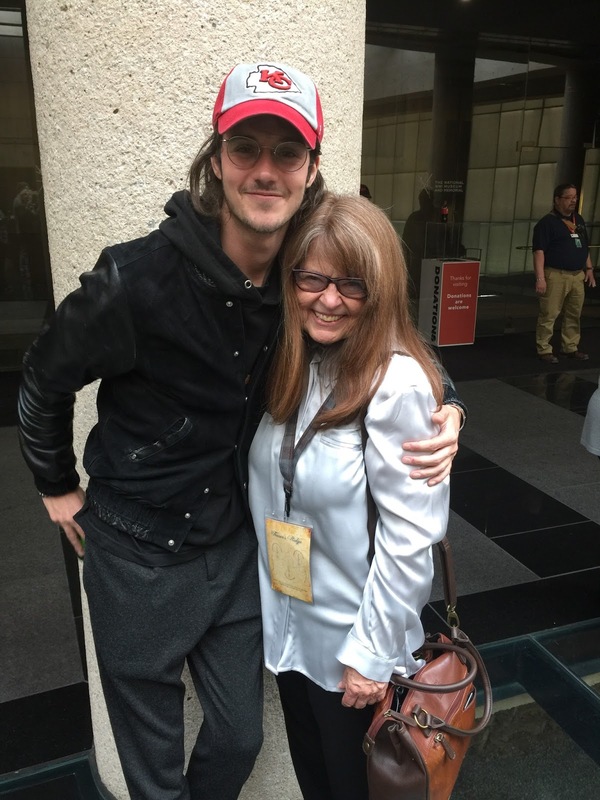 I have learned so many new skills as a result of my involvement with Outlander. I seriously doubt if I would have been on Twitter or Instagram or even been in a Facebook group without Outlander. Outlander fans taught me what I know about social media. And, of course, there is travel. 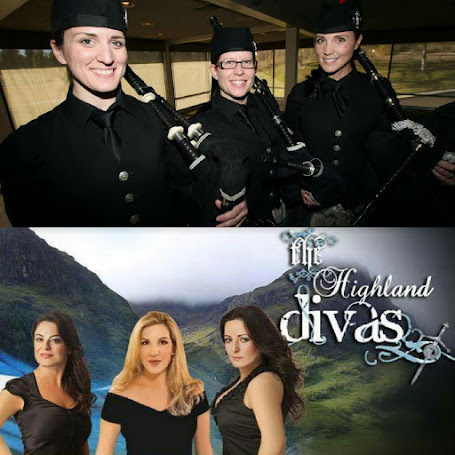 I have traveled to Scotland four times and am going back in June. 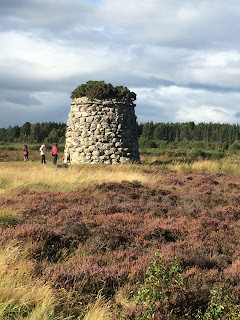 So far I have visited 35 Outlander filming sites and will visit some others this year. It has been so much fun to walk in Jamie’s and Claire’s steps. But my trips to Scotland are for more than Outlander. Scotland is an amazing country, breathtaking in its beauty and fascinating in its history. 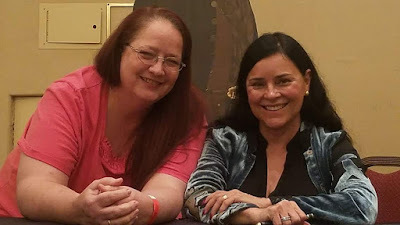 Last year I went to Seattle to Emerald Con (my first con and quite an experience), attended two Outlander in the City events in NYC, and traveled by myself to Rome for Jibland2. I extended my Rome trip with an amazing tour of Italy. I had never traveled out of the country by myself before, and it was a great adventure for me. 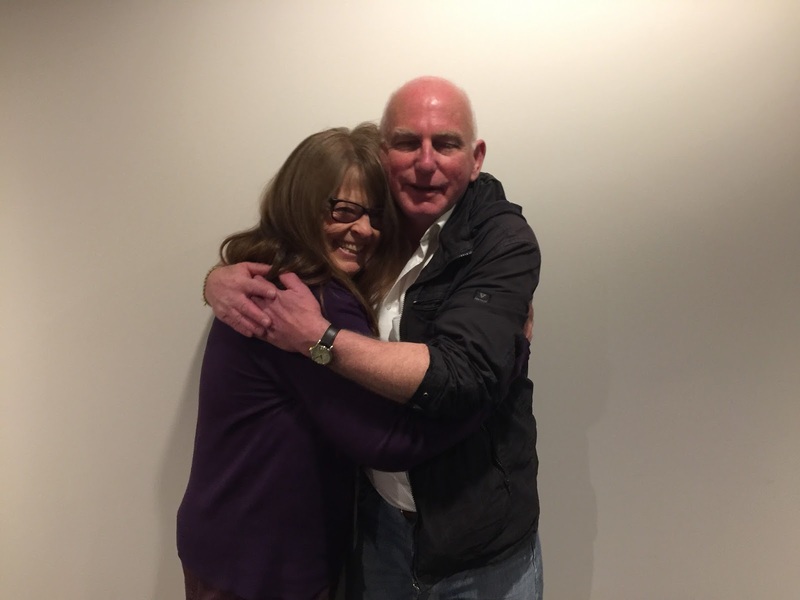 My involvement with Outlander and MPC gave me the courage to travel alone. 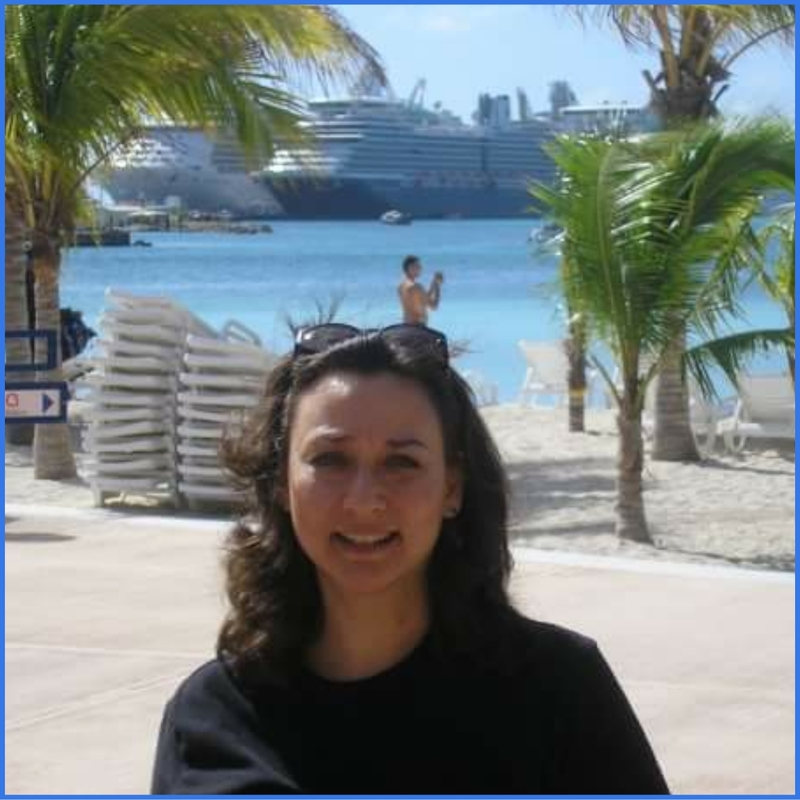 This year I’m going on Diana’s author cruise through central Europe. 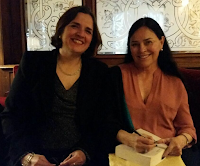 I’m also attending Outlander events in Kansas City, Chicago and North Carolina. Outlander gives me a great excuse to travel, meet friends and share amazing experiences with them. ● Is this the first fandom you are a member of? Yes, this is the first time I have ever been a fan girl. These are the only books and series that could have inspired me to be this involved. There are other shows and books that I truly enjoy, but my love for Outlander is different. 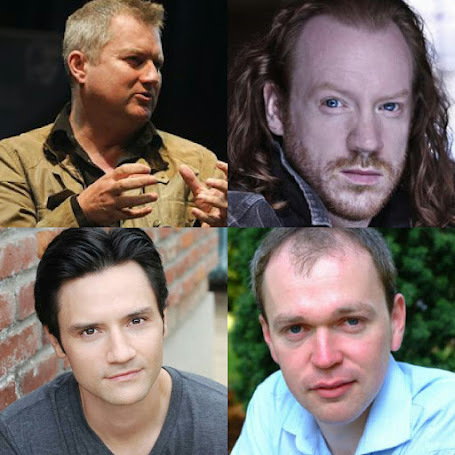 I have been very fortunate to have met quite a few of the actors. I cannot pick just one as my favorite because the meetings have been so different. 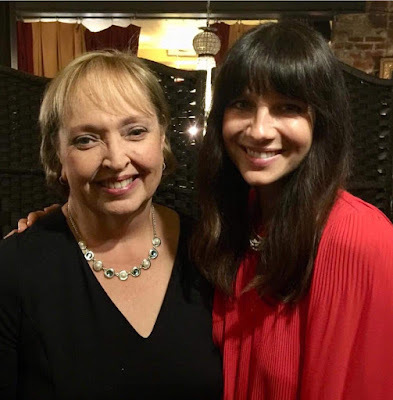 I met Sam at Emerald Con and then in New York at Barbour and at the NYC Sam/Cait event. 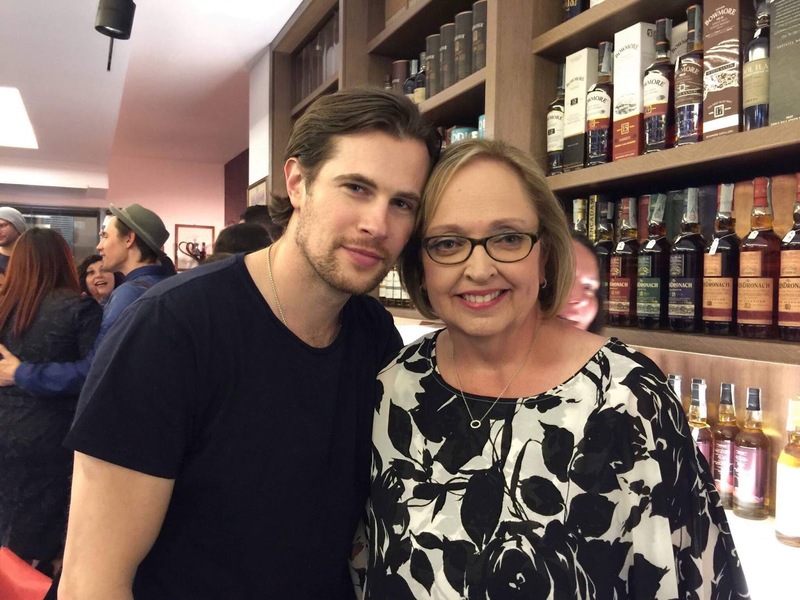 We had a great conversation about Clan Heughan and fund raising. He also took a picture with Clan Heughan members who were there. It was a huge fan moment for me. The second favorite moment was meeting Cait in Glasgow while they were filming the Boston scenes. It was totally unplanned. We received a text from a friend telling us that Outlander was filming near the university. We happened to be in that area. We found them and stood in the rain from mid-morning until late afternoon. We briefly saw Tobias as he was leaving for the day. Cait continued to work throughout the afternoon. When they finished filming, we were able to meet Cait and speak with her for a few minutes. It was a relaxed meeting, and she took her time talking to us in spite of the rain. It was a “pinch me” experience. When I was in Rome, I had meet and greets with Graham, Duncan, Steven, and David. I also attended a welcome party and an evening in Rome with them. It was an amazing experience, and they were all so much fun. I found them all fascinating conversationalists and very genuine people. A common theme in all my encounters with the Outlander stars has been their sincere appreciation of the fans. It is truly wonderful that they feel this way. They have certainly brought this Outlander fan amazing experiences and opportunities. I’ll always be thankful that Diana wrote a book.